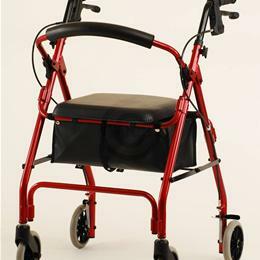 The GetGo Classic is our lightest 4-wheeled walker available with hand brakes. 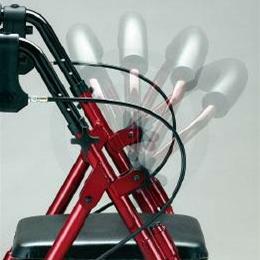 This versatile walker combines a lightweight frame with our patented "Feather Touch" hand braking system. Easy to lift and perfect for strolling outdoors. The GetGo Classic has a smaller padded seat than the Cruiser Deluxe and the basket fits under the seat instead of in front of the walker. The basket is included (14"w x 8"l x 7"d). The GetGo Classic also features the NEW EASY FLIP-UP BACK REST. Our walkers include reflectors for additional user safety. Weight capacity - 300 lbs. Approximate patient height - 5'4"- 6'1" Wheel size - 6"
Patient Height: 5'4" - 6'1"